What a hypocrite! @realDonaldTrump makes hateful and racist rants every day about how immigrants are “bad” for the country, but he had no problem hiring undocumented immigrants to help him build the Trump Hotel in DC or Trump Tower in New York City. Why is the Trump administration bombarding us with messages about immigrants being bad? They are making this huge deal about “open borders.” They are portraying immigrants as murderers, rapists, criminals, gang members, etc. They are parading people on stages holding up pictures of family members murdered by immigrants. Somehow, it’s made the country think that immigrants are something bad, criminal, to be avoided, to be punished. The president keeps saying that we “want open borders” because we don’t think building a wall makes sense, or because we believe separating children from their parents at the border is inhumane and immoral. The president should take a class in Logic 101. I do not “want open borders.” Of course, our borders should be controlled and we need immigration legislation that makes sense. I do not think we should have open borders. I do not think building a wall would solve any of our immigration problems. To get his way, logical or not, Trump misstates reality and disseminates untrue facts. 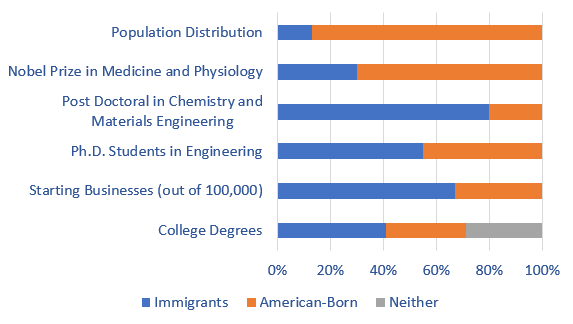 Check out my post on immigrant statistics and note that immigrants in America are way better educated than American-born people, they start more businesses, and they have more college degrees. Of the 400 richest Americans (according to Forbes), 41 are immigrants. Even illegal immigrants (undocumented migrants as we call them) have a place in our society by working in low-wage jobs in agriculture, food service and – yes – in Trump properties. To solve the undocumented migrant problem, I believe we need to institute a proper guest worker program, so the migrants can live here legally while they are gainfully employed, contribute to our society and economy with their services, and pay taxes to support our system. In the modern world there is no way to keep poor people out of rich countries. You can build walls, only to find that the people fly over the walls or dig under them. The solution is proper trade, fair integration, mutual collaboration on solutions, and yes, enforcing the laws of the nation. Immigrants have made this country what it is today. Trump’s great-grandfather was an immigrant. Trump’s wife is an immigrant. I am an immigrant, and I am proud of it. In 1939, they called places like this Concentration Camps. What do we call them now? To be fair, this picture is from 2014, when Obama was still president. We have done this for a while. I wonder what the conditions are like now? Here is another example of Trump’s poorly thought out, hastily written, deportation order. Families of active duty soldiers, currently serving in the Middle East, are being ripped apart and deported, while the soldiers are helplessly trapped overseas. It shows how this does not make sense, but in the age of Trump, the self-proclaimed law and order president, most actions are executed before they are thought out, rights of individuals be damned. Original article by Nathan Fletcher here. Imagine you are a member of the United States military deployed on the front lines confronting ISIS or other terrorist threats. Suddenly you get a desperate phone call from home — Immigration and Customs Enforcement has arrested your family and they’re facing deportation. Think it can’t happen? Think again. Think Trump. The Trump administration’s draconian and hastily drafted immigration orders rescind a key protection for military families so that now even military spouses and children can be rounded up and deported. This will weaken our armed forces. It will harm thousands of military families. And it’s wrong. Put simply, the program allowed immigration authorities to give the immediate family of military service members a temporary reprieve from enforcement actions based on their immigration status. It specifically barred those with criminal convictions from these protections. This was as much about national security as it was about upholding our commitment to support our troops. The Department of Homeland Security wrote, at the time, that “military preparedness can potentially be adversely affected if active members of the U.S. armed forces … worry about the immigration status of their spouses, parents and children.” We need our service members focused on accomplishing their mission and the safety of each other. When you deploy to war, your greatest worry is not yourself. You worry about your family left behind. The least we can promise those willing to give their life for our country is that their immediate family members can remain in that same country. By all accounts, the policy has worked well. Yet the Trump administration’s new immigration enforcement policy eviscerated “Parole in Place” protections. It does not continue a policy that reflects a promise made to recruits who joined the United States military in the last four years. The new enforcement directive could have easily maintained the protections of this unique program, as it did a few others. It could have made clear that agents of the U.S. government will not round up and deport the spouses and children of our active duty service members. Instead, it casually dispenses with exercises of executive discretion based on a “specified class or category of aliens.” The administration either did not know or did not care that one of these specified classes included military families. 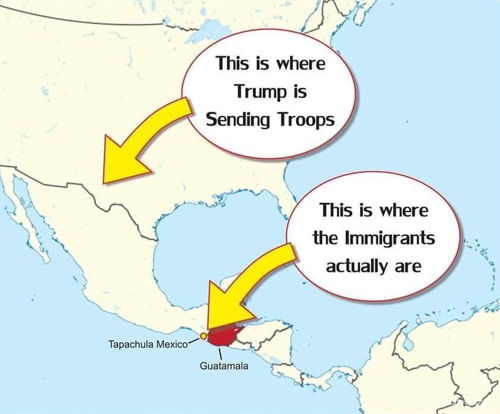 That may be good politics for the red states, but it’s terrible national security policy for the United States, and a slap in the face to thousands of deployed troops with immigrant roots. We cannot allow our troops to be consumed with fear and anxiety about their families while deployed on the front lines. We cannot indiscriminately endanger the family members of the citizens who sacrifice the most for our nation. The Trump administration must immediately and explicitly clarify that the “Parole in Place” program for military families remains the law of the land. If Trump can turn out sweeping executive orders in a matter of days, surely he can fix this terrible mistake in a matter of minutes. Our prisons are bursting with illegals right now. 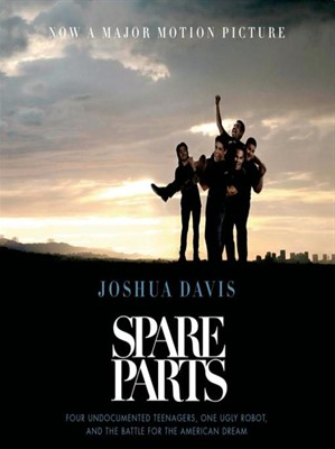 For the American-born population of males 18 – 39 years old, 3.3% are in prison. That’s a huge number. In contrast, for foreign-born men 18 – 39, 1.6% of them are in prison. So the likelihood of being in prison for an immigrant is less than half of that of an American-born man. 12.9% of the United States population is foreign-born. I am one of those. From this chart you can see that immigrants are much more educated than American-born, on average, in all categories. It’s most obvious and overwhelming in the Ph.D. categories in engineering and sciences. Also, immigrants are twice as likely to start businesses, 41% of them have college degrees, versus 30% of American-born population. 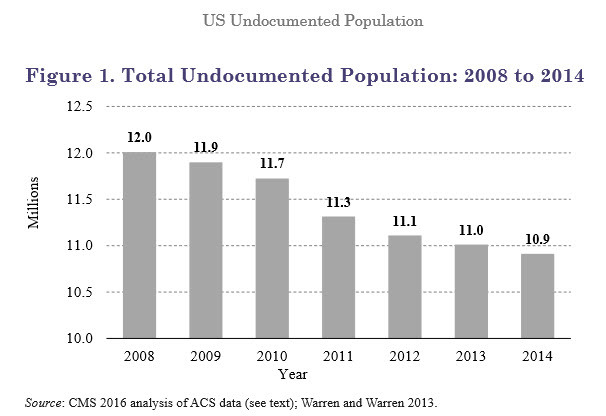 This is not to say that illegal immigration isn’t a problem in the United States. It is. It is a problem that needs solving. But after decades of Congress not doing anything about it but whining, it is completely irresponsible by the president to foment immigrant hatred that covers all foreign-born people in its dragnet, illegal or not. The bigots among the population are now feeling empowered to abuse immigrants indiscriminately. People are getting killed on the streets based on the color of their skins. It is right to enforce the laws of the country. It is not right to create or stir up vigilantism against people who “look different” or “speak another language.” Our president has a responsibility to calm the nation, to protect its citizens and to enforce its laws. This president, however, incites fear and bigotry with his rhetoric, he lashes out indiscriminately against entire groups of people, he divides and he spreads misinformation. He says immigration is a problem in the United States. No, it is not a problem. Immigration creates jobs, raises the level of education, and produces the most industrious and productive section of our population. Lashing out at immigration does not make America great, it makes America shrivel.